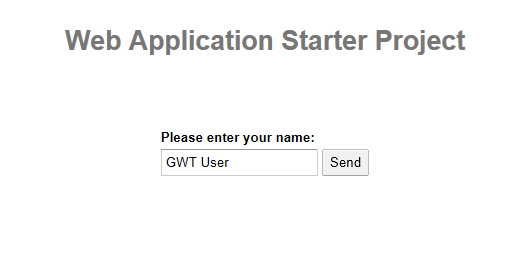 A simple post about a problem that I encountred during the development of a personnal GWT application with Spring Security and its deployment on Google Cloud GAE. 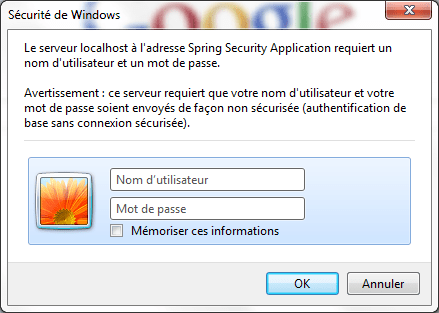 Cette configuration redirige l’ensemble des requêtes HTTP vers Spring Security. We have used the MD5 hashing algorithm in Spring Security; For MD5 conversion and MD5 reverse lookup, go to http://md5.gromweb.com/. The Supported hashing algorithms in Spring Security are plaintext, sha, sha-256, md5, md4. 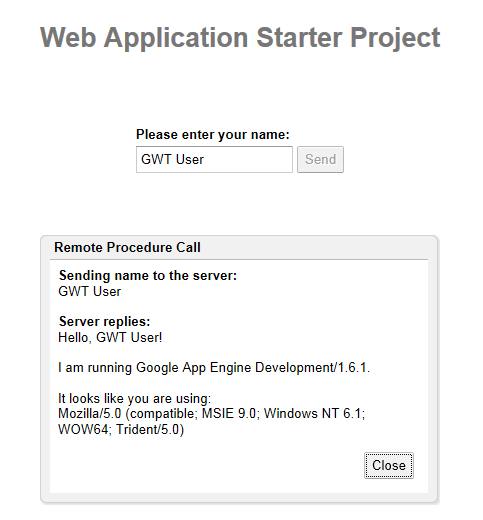 GWT/GAE: Deployment an application on GWT embedded server named Jetty in Hosted mode. —> Problem: No authentication prompt displayed !!!! However, when we click on Send button, the authentication prompt id displayed! —> Problem: THE FIRST SCREEN IS NOT SECURIZED BECAUSE NO AUTHENTICATION PROMPT DISPLAYED !!!! If we deploy this application on Tomcat server. 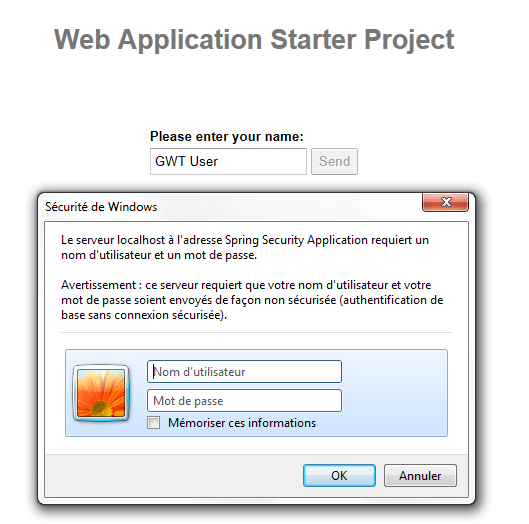 To deploy an application on the Tomcat server see the post GWT/GAE: Deployment an application on external server TOMCAT. —> OK: The authentication prompt is displayed !!!! Authenticate you with the admin account (admin/mdp4admin), the first screen is securized! —> OK: THE FIRST SCREEN IS SECURIZED BECAUSE THE AUTHENTICATION PROMPT IS DISPLAYED !!!! 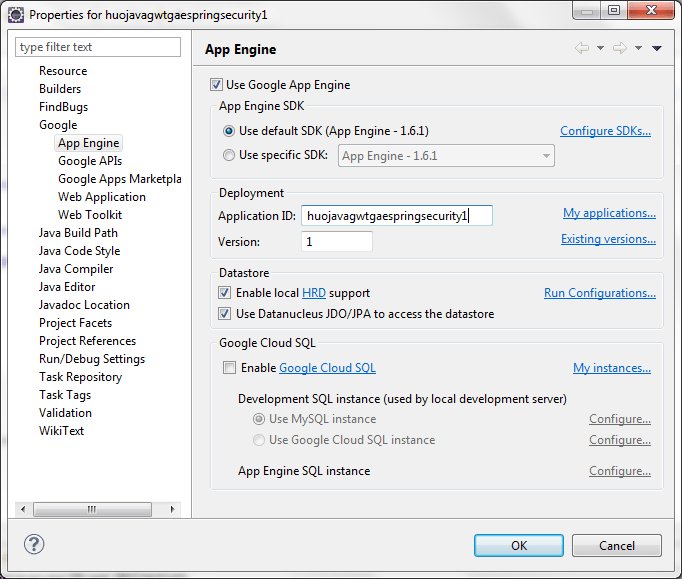 Go to the Google’s Cloud (GAE) dashboard at the URL http://appengine.google.com/ and create an application with the application identification (ID) equals to huojavagwtgaespringsecurity1. Note: These informations (application ID…etc) concerning the App Engine Config in a Eclipse Project are stored in the appengine-web.xml file of the project. Problem: So, we have the fact that the first screen/page Huojavagwtgaespringsecurity1.html is not securized by Spring Security only on Jetty server and Google Cloud., however, on Tomcat server, no problem. Solution:The solution is very simple: rename your HTML pages to JSP! So, they are filtered and JS resources are loaded after authentication. –> Click sur “Send”: The authentication prompt is displayed because a request has been sent to no static resource on server. –> With the account “tudu/mdp4tudu”: OK the authentication prompt displayed!! –> With the account “admin/mdp4admin”: OK the authentication prompt displayed!! –> With the account “guest/mdp4guest”: OK the authentication prompt displayed, but, we obtain a “HTTP 403 – Access is denied” response owing to the role restriction. –> With the account “tudu/mdp4tudu”: OK the authentication prompt displayed, but, we obtain a “HTTP 403 – Access is denied” response owing to the role restriction. 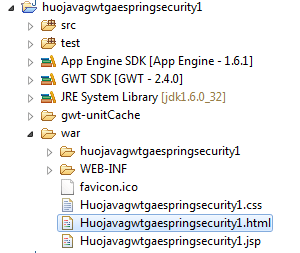 Notes: This file huojavagwtgaespringsecurity1.zip contains the project of this article but it needs to add the libraries (for GWT and GAE) appengine-api-1.0-sdk-1.6.1.jar, appengine-api-labs-1.6.1.jar, appengine-jsr107cache-1.6.1.jar, datanucleus-appengine-1.0.10.final.jar, datanucleus-core-1.1.5.jar, datanucleus-jpa-1.1.5.jar, geronimo-jpa_3.0_spec-1.1.1.jar, geronimo-jta_1.1_spec-1.1.1.jar, google_sql.jar, gwt-servlet.jar, jdo2-api-2.3-eb.jar, jsr107cache-1.1.jar, (for spring security: I know all librairies are not mandatory) aopalliance-1.0.jar, asm.jar, aspectjrt-1.6.8.jar, aspectjweaver-1.6.8.jar, cglib-2.2.2.jar, commons-logging-1.1.1.jar, javassist-3.4.ga.jar, jstl-1.2.jar, spring-security-config-3.0.5.RELEASE.jar, spring-security-core-3.0.5.RELEASE.jar, spring-security-web-3.0.5.RELEASE.jar, spring-aop-3.0.3.RELEASE.jar, spring-asm-3.0.5.RELEASE.jar, spring-beans-3.0.5.RELEASE.jar, spring-context-support-3.0.5.RELEASE.jar, spring-context-3.0.5.RELEASE.jar, spring-core-3.0.5.RELEASE.jar, spring-expression-3.0.5.RELEASE.jar, spring-tx-3.0.3.RELEASE.jar, spring-web-3.0.5.RELEASE.jar and spring-webmvc-3.0.5.RELEASE.jar. Huseyin! You have saved me from hours and hours of headaches! Thank you for your post! Thank you for your message, I am very happy to have returns from my blog’s visitors. Hurray! I have one of the top 10% most viewed @LinkedIn profiles for 2012.